If you ever find yourself in the mood for a healthy multi-colored carrot salad, please grab this delicious and healthy recipe. This salad was an instant hit in my family from the day we made it until now. 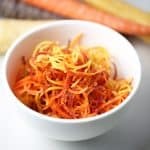 It’s healthy, easy to make, affordable and does not take a ton of ingredients 🙂 All you need is a bag of delicious rainbow carrots, a bit of white vinegar, sugar, Sriracha sauce and freshly ground black pepper. Orange carrots are rich in bet and alpha carotene (Great for healthy eyes). 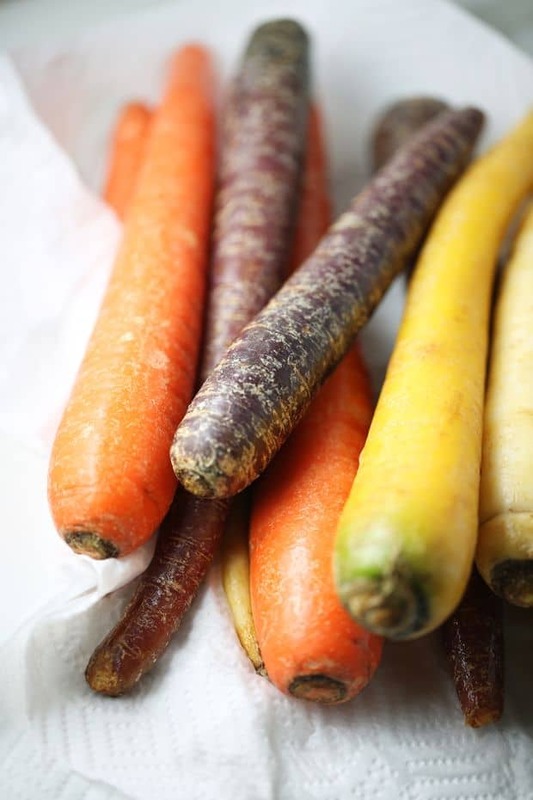 Purple carrots have anthocyanin, beta and alpha carotene pigment ( Great for your heart). 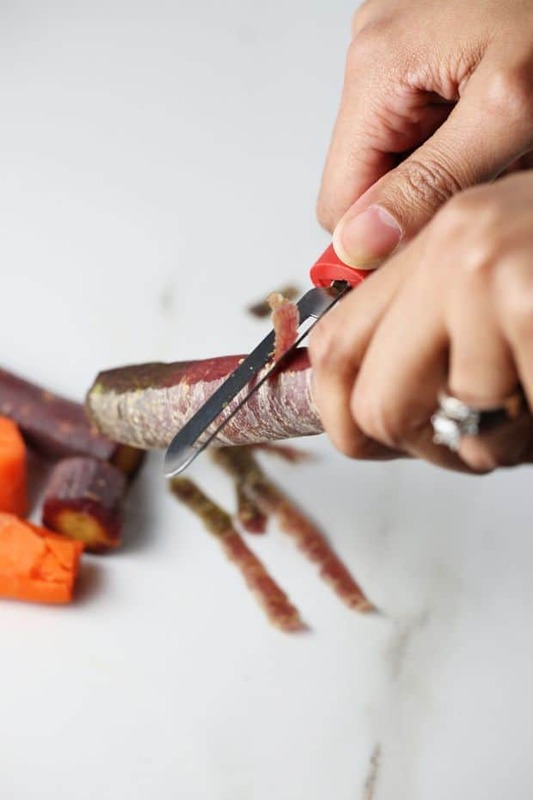 Red carrots are rich in lycopene and beta-carotene pigment (Great for lowering a cancer risk). Yellow carrots have Xanthophykks and lutein (Great for eye health). White carrots are great for a healthy digestion. How to prepare carrot salad? Our first step is to wash the carrots thoroughly under cold water and peel the skin. 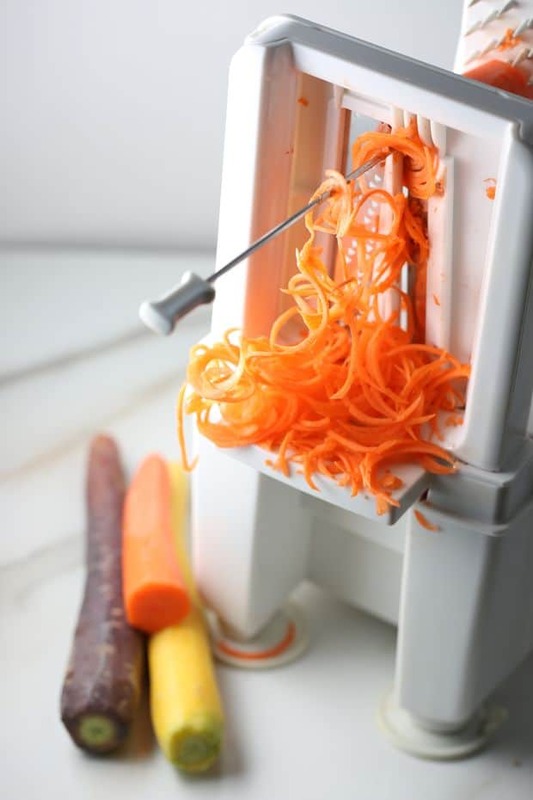 Our second step requires a spiralizer to shred the carrots into long strips. 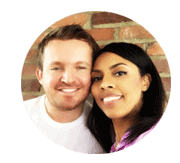 If you don’t have one yet, you can pick one up relatively cheap at any box store or even at Amazon ( I love my Amazon Prime membership). 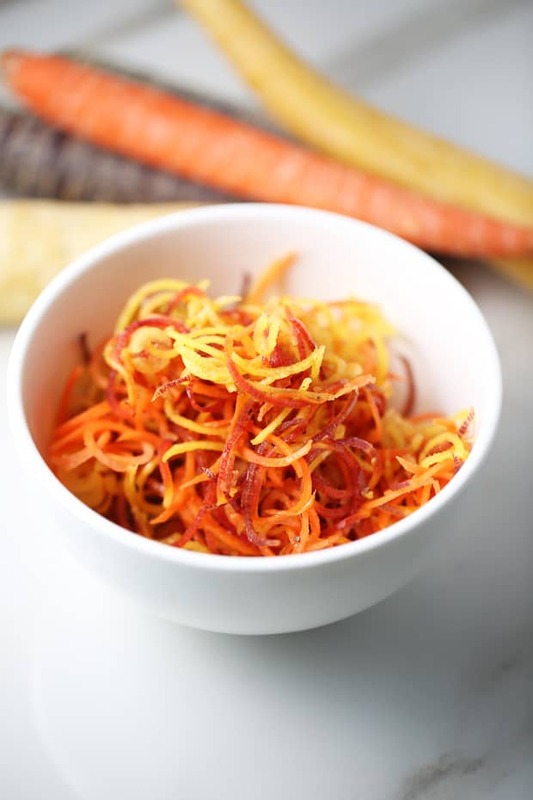 Take a look at this amazing spiralized multi-colored (Rainbow) carrots! How to make carrot salad dressing? Now when you find yourself a bit more hungry, please take a look at this delicious Soba noodle Salad. 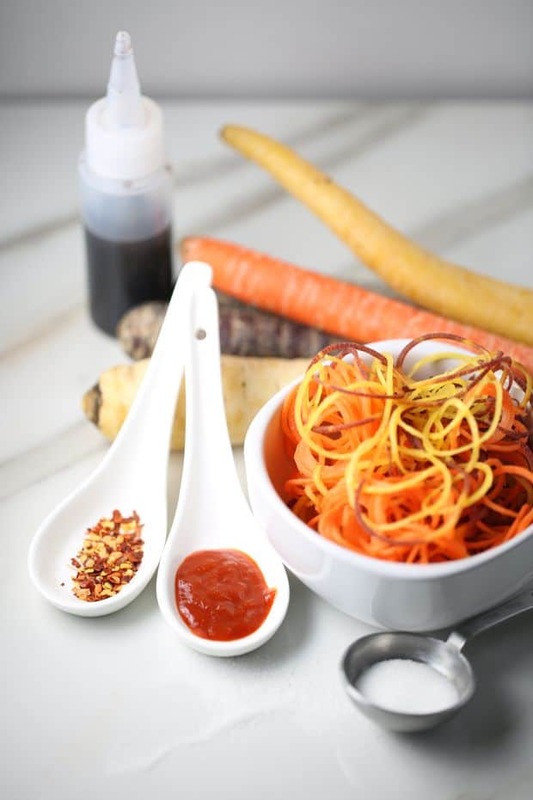 Healthy multi-colored carrot salad - Spiralized to perfection, seasoned with vinaigrette, sugar, sriracha. Healthy and delicious at the same time. Works well by itself or served as a side to your main dish. Wash carrots under cold water and peel. 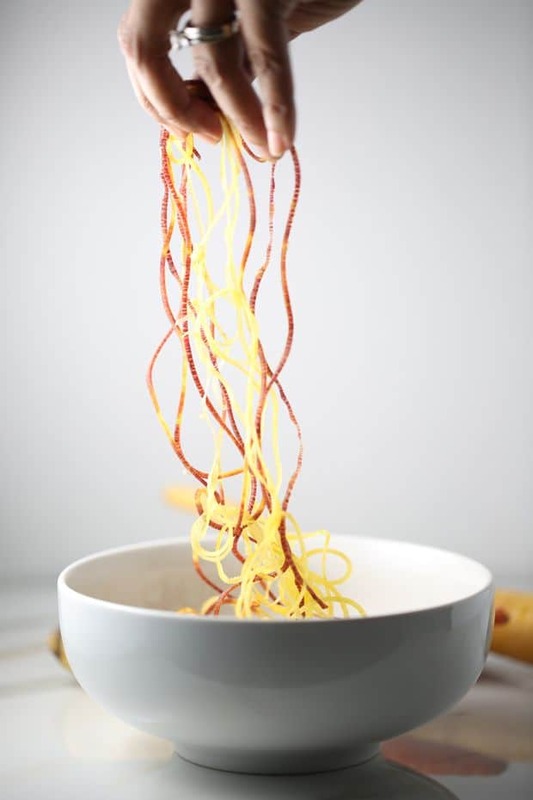 Use the spiralizer to make the carrots look like thin pasta. Transfer carrots into a serving ball. Add Balsamic vinaigrette, sugar, white vinegar, sriracha sauce, red crushed pepper flakes and freshly ground pepper. Rainbow carrots are so cool!